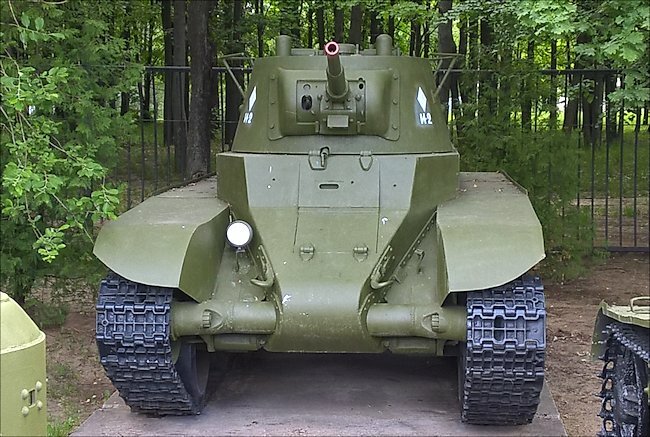 Soviet WW2 BT-7 model 1937 tank with sloping armour and Christie suspension and upgraded comical shaped turret from the model 1935. I only know of 12 surviving BT-7 tanks left in the world which is surprising considering how many thousands BT-7 tanks were built. The BT 7 series of tanks were the fast tanks, what the British would call crews tanks. The initials BT stand for the Russian words for fast tank. They accompanied infantry support tanks such as the T-26. The American designer J Walter Christie was obsessed by speed. Whereas all other tank designers were making heavily armoured slow tanks that kept pace with the infantry advance Christie had different ideas. He wanted to build a fast car that had a gun and tracks to enable it to cross rough ground. Even the tracks were optional on some of the tanks that use Christie’s suspension system. The tracks could be taken off by the tank crew and driven on the wheels when travelling on roads. 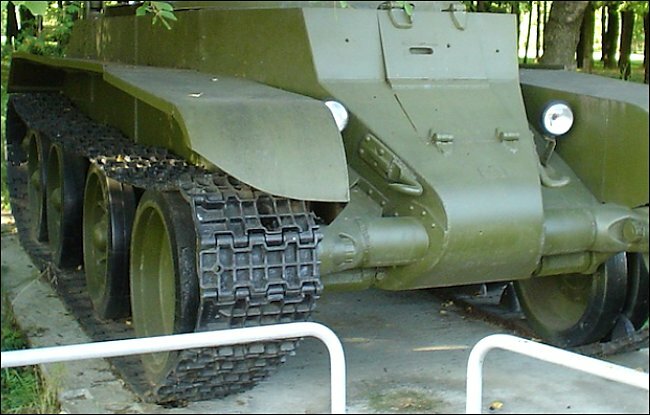 The BT-7 model 1937 tank had wider tracks and larger wheels that the model 1935. If you look at his T3 or T4 medium tank designs and then compare them with the Russian BT-2, BT-5 and BT-7 tanks you can see they share similar design features. If you look at the front of the tank you should notice that it is welded. This was very radical at the time as most tanks of this period and up to the beginnings of World War Two were riveted. Welding metal together is much stronger. The front hull armour was sloped and pointed. This was a great technical advance as sloping armour increase the amount of thickness and enemy shell had to penetrate and also increase the likelihood that shell ricocheting off. You can see this very important design feature being carried on to the T 34, KV and IS tanks. 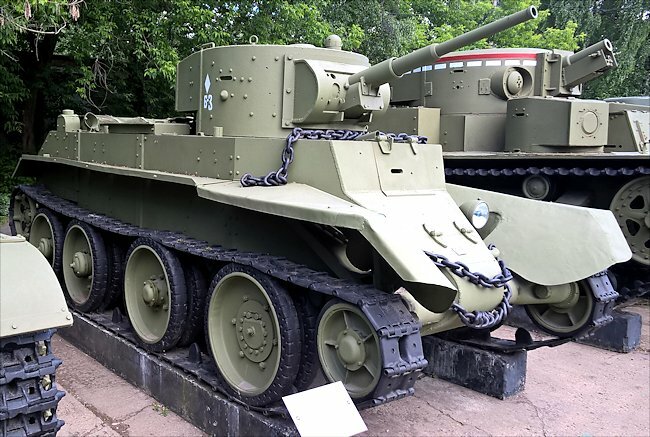 This is the earlier BT-7 model 1935 tank. Look how thin the tracks were and the different turret. The Germans were very impressed with the effectiveness of the sloping armour on the T34/76 Russian tanks they encountered on the Eastern front. The tank designers incorporated sloping armour on most of their tank’s and tank destroyers built after 1943. The front slope of the tank hull is dominated by a two-piece drivers hatch which folds forward and up, very similar to those found on the World War I French Renault FT tank. Either side of the driver’s position there are to tow hooks, headlights and a horn.